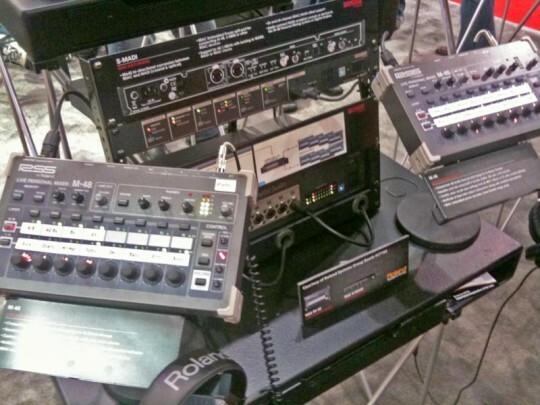 When I saw this in the Digico booth, my heart lept...If my blog layout had subtitles, it would be, “And why Aviom A-16II is now irrelevant.” Longtime readers of this blog will know that I’ve been a fan of the RSS M-48 personal mixing system since it was announced over a year ago. It sounds fantastic, has a ton of flexibility in signal routing, includes extras such as a built-in ambient mic, reverb, a 3-band EQ on each channel, a limiter, separate phones and balanced stereo line outs, and a record out function. The only problem has been it’s application has been somewhat limited since it works with the REAC digital snake system. This can be a good solution for analog mixing systems, or when used with the very competent line of M-mixers (M-400, M-380 and the new M-300) from RSS. However, for users of any other digital console, trying to use the M-48s required either a passive split, or a few extra D-A, A-D hops. That just changed with the introduction of the S-MADI Bridge. This opens up the entire world of digital consoles for the M-48.The S-MADI Bridge is just that; a format converter between MADI and REAC. Since it’s doing simple format conversion, the latency is extremely low (well under 1 msec). And since every major digital console manufacturer is either based or supports MADI, the M-48 is now the simply the best personal mixing system on the market. What makes the M-48 so unique is that it’s essentially a 40 channel digital mixer. It has the capability to present those 40 channels in any combination of 16 stereo groups the user desires. And that combination can be different for every user on the network. It took me a while to grasp exactly what that means, so let me show you how a system would be set up. In this case, we’ll use our new SD-8 as an example. Hey, that even looks like an SD-8!As you can see, we take the MADI output of the console and send it to the S-MADI Bridge. In my case, I’ll simply copy MADI 1 to MADI 2 and in effect, send the first 40 inputs of my stage rack straight to REAC. I’ve had to do a little shuffling of my input patch to make it work, but since the SD-8 has a completely customizable surface, that shuffling will be invisible to the user. A single CAT-5 takes REAC to the stage and distributes it via an S-4000D distro. The S-4000D is controlled remotely either by an M-series mixer, or in our case, a PC running the remote control software. Here’s where it gets cool. As I said before, each mixer receives all 40 channels. 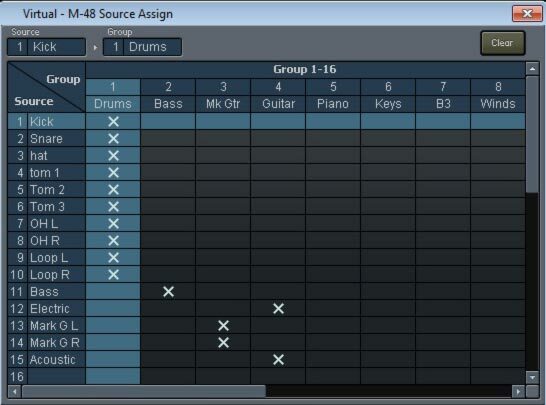 In software, you can select which channels go to which groups on the M-48. It’s really like assigning input channels to a group in a mixer, only in this case, you’re ticking off checkboxes in software. You could theoretically assign all 40 channels to one group, but that wouldn’t be very useful. Instead, we might assign all the drum channels to a stereo group 1, for example. Assigning input channels to groups is as simple as ticking off Xs.As you can see, I’ve chosen 10 channels to assign to group 1. The Bass get it’s own group, Mark’s electric guitar (a stereo feed) gets assigned to group 3 and so on. So that’s pretty cool, but what if the bass player wants a little more kick in his drum mix. One way to do that would be to assign the kick to it’s own group and assign the rest of the kit to another. An alternative (and much cooler way) is to simply change the mix of the group. Personal mixing for your personal mixer.As you can see in this shot, I’ve kept the level of the kick and snare up, while dropping the level of the toms and overheads. What takes the M-48 from the realm of “pretty cool” to “off the shizzle” is the fact that this change affects no one but the bass player. 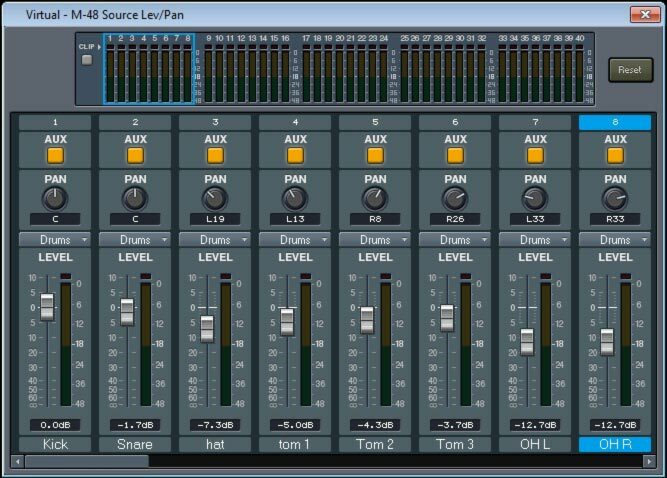 That’s right, you can individually manipulate the group mixes of each M-48 on stage, without affecting any other one. You’ll also notice I’m doing some panning of the inputs as well. Remember that this is for this mixer only. When I was laying out my previously spec’d Aviom system, I spent a good 3-4 hours trying to come up with some magical combination to fit my entire band into 16 channels.I made it work, but there's a good chance someone will be unhappy. I took a crack at setting up a few M-48s and discovered that I can do just about anything I want and easily come up with a custom config for each band member, and have a few groups left over on almost every mixer. Behold the power of stereo groups. And this is what I think makes Aviom irrelevant. One of the big features of the SD-8 is that each channel can be mono or stereo; it doesn’t care or affect channel count. 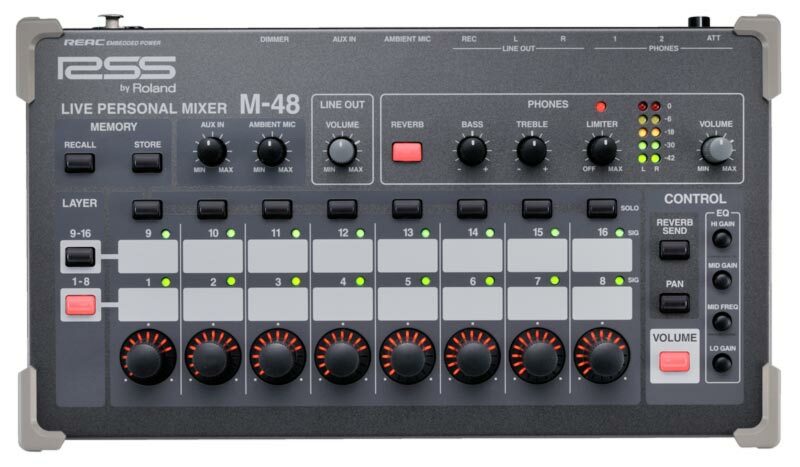 The M-48 goes that one better by taking as many input channels as you want into a stereo group, in each personal mixer, which frees up all sorts of aux sends, groups and matrix mixes on your desk. I actually have more of all three of those now than I know what to do with! Added to all the additional features the M-48 has, and it makes it pretty near impossible to recommend an Aviom personal mixing solution anymore. And in case you’re wondering, it sounds great! The first time I heard the mixer, I was thoroughly impressed with the full, rich sound it produced; which is in contrast to the somewhat thin, brittle sound the Aviom is known for. The A-16II suffers from a lousy headphone amp, which does it no favors. Since the M-48 has balanced line outs, it’s much easier to connect to IEM transmitters, powered wedges or unpowered wedges (though the latter will require a few extra cables on stage.